Hopefully you will be coming up with a Sweet Dreams square soon. That was a great way of keeping you from being all frustrated because you couldn't sleep! hey nice squre! wish i were tht productive when I can't sleep. ha ha ha. I think the popcorn stitch does not really show off. A few minutes ago I posted a runner, the pattern is called Frech Garden and it has also some popcorn stitches. Please look it up and tell me your opinion. Thanks in advance and best regards from Vienna. it! I printed out a swirl pattern but never got around to trying it. What size is it (inches) ? 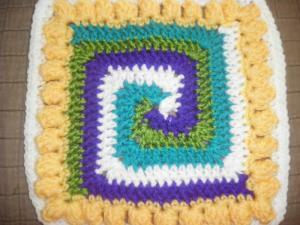 Make a few every time you have scrap , then make an afghan. I've gotten up in the night and when I couldn't get to sleep. I've created some original designs that way. I made a square with a happy face in the center and made a few afghans with them. I think of it as happy dreams afghan. That popcorn stitch it is showing of really well here. You could add few rows and make a pillow out of that. Just a suggestion:).